It’s Summer…which in Atlanta means it’s time to CHOP! Even though we are die-hard Penn State and Steelers fans, one of the first and best things we adopted when moving to Atlanta ten years ago was a penchant for the Braves. They are our MLB team, no question. Everything about it- the team, the stadium, the experience…just fit for us. We love the Turner Field, have had great service and refreshments there, and always seem to have a great time, no matter where we find ourselves sitting. It’s officially summer for everyone in Atlanta now, and with Father’s Day coming up this weekend, a Braves game seems like a great choice for a family outing. Here’s some info about what’s happening with the Braves in the next week. We actually hope to make it to one of these games, and if we do, I’ll be sure to post about our experience and offer some tips for taking kids to a game. Let’s go Braves! · Braves Strike Out Hunger Fridays Presented by Kroger: The Braves will host a food drive prior to every Friday home game during the 2013 season to benefit the Atlanta Community Food Bank. Fans can donate 20 cans of food or $20 at the Strike Out Hunger Tent and receive an autograph from a Braves pitcher. Limit of one signature per donation. On Friday, June 14, fans will have the opportunity to get an autograph from Braves pitcher Craig Kimbrel in Monument Grove from 6:35 p.m. – 7:00 p.m. For a list of items needed and future food drive collection dates, visit braves.com/hunger. · Friday Night Rising Stars Series: The Atlanta Braves Friday Night Rising Stars Series provides an opportunity for up-and-coming bands ready to rock and entertain thousands of fans at Turner Field, a stage to perform prior to select home games as well as postgame during the 2013 season. OnJune 14, the Braves welcome Sundy Best, to Fan Plaza as well as a special post-game performance before fireworks on the field. With influences ranging from country, bluegrass, rock, soul and rhythm and blues, the duo produces music that, at times, is hard to classify. They are crowd rockers and party starters. The band’s visceral sound and incredible live shows have gained them a loyal following. · Jerseys Off Our Backs Presentation: The Atlanta Braves auctioned off game-worn jerseys for fans to bid on with proceeds benefitting the Atlanta Braves Foundation. Winning bidders will receive two tickets to the game vs. Giants and will be presented on-field with the jersey by a Braves player immediately following the game. Each jersey will be authenticated and autographed for the lucky winners. · Sport Clips’ “Chop”: Every Friday home game during the 2013 season, Sport Clips Haircuts is cutting hair for charity. Sport Clips stylist will give haircuts to fans at Top of the Chop for a $5 minimum donation to the Atlanta Braves Foundation. Enjoy a Braves game view from the Top of the Chop and a Sport Clips haircut while making a difference in our community. Sport Clips. · Friday Night Fireworks, presented by Georgia Lottery: Enjoy the Braves game and a spectacular fireworks show set to music following every Braves Friday home game. · MLB Drawstring Giveaway presented by MLB Network: The first 45,000 fans will take home a MLB drawstring bag. · Pitch, Hit & Run Presented by Scotts: The Atlanta Braves and Major League Baseball host the Team Championship level of the Pitch, Hit & Run official skills competition. Sixteen finalists from Local and Sectional skills competitions throughout Georgia, North Carolina, South Carolina, Mississippi, Alabama and Tennessee, compete on the field in the skills of running, batting, fielding, and throwing. The finalist will be honored during an on-field presentation at the game. · Live Music in the Plaza: Fans will enjoy live music in Fan Plaza as Braves Band of the Year contestant, Nine Times Blues, will perform. The critically acclaimed, Atlanta-based alternative rock band has been selling out shows all around Atlanta. While they clearly wear their influences on their sleeve, invoking the classic alt-rock and power pop that first inspired them to pick up instruments, Nine Times Blue has a radio friendly, modern sound that is all their own. · Braves Country 4-Miler: Summer is finally here and to celebrate fans can put their best foot forward, literally, and race on down to Turner Field for the Braves Country 4-Miler on Saturday, June 15. The route, beginning at 7:15 a.m., will take racers around Atlanta and culminate on the warning track near the Braves dugout. Race entry includes a ticket to Saturday’s matchup against the San Francisco Giants and a short-sleeve performance shirt. Race entrants, and their family and friends will take part in a parade around the field before the game. Registration closed on June 12. · Alumni Sunday: Braves alumni Brad Clontz and Mark Lemke will greet fans and sign autographs pregame in Fan Plaza from 6:00 p.m. – 7:00 p.m.
· In honor of Father’s Day, all dads and sons are invited to lineup at the Hank Aaron ramp at 6:30 p.m. for a pregame parade around the warning track. · Hometown Hero: During the 6th Inning the Braves will pay tribute to a local “Hometown Hero” from the United States Military. · Georgia Prostate Cancer Coalition: Promotes awareness of prostate cancer in Georgia – including the make of the disease, importance of early detection, treatment options and survival. The organization will be onsite in Monument Grove from 5 – 8:00 p.m. distributing information to fans. God Bless America: During the 7th Inning Stretch, Atlanta’s fan-favorite Timothy Miller will perform God Bless America. Kids Run The Bases: Presented by Children’s Healthcare of Atlanta, we invite all kids 14 and under to run the bases after every regular seasonSunday home game. Just meet at the Hank Aaron ramp at aisle 129 on the Field Level. Prostate Cancer Awareness Day: The Atlanta Braves and Major League Baseball will host a celebration of survivorship honoring men who have courageously battled prostate cancer. Survivors will receive a free game ticket, commemorative t-shirt, and the opportunity to participate in a special on-field ceremony. During the game, players, umpires, coaches and on-field personnel will wear MLB blue ribbon wristbands and blue ribbon decals on their uniforms. Other blue ribbon elements include official blue dugout lineup cards and the logo will be affixed to the bases. For more information, visit www.braves.com/pcawareness. · Braves Wives Oklahoma Disaster Relief Efforts On-Field Check Presentation: The Braves Wives will present to the Baptist General Convention of Oklahoma Disaster Relief Fund with a check for $13,000 that was raised through the Brown Bag Bonanza/Mystery Baseball sale on June 2. · Sport Clips $8 Night: Get Terrace View seats for only $8 to any Monday game this season! · Holeman & Finch Burger Ticket Package: New to Turner Field in 2013, the Holeman & Finch Burger is being served up at three locations throughout the ballpark. This widely popular handcrafted burger is guaranteed for fans that purchase the H&F Ticket Package. A $32 ticket (only 24 available per game) gets fans a reserved Outfield Pavilion seat on the H&F Burger Row and H&F Burger Pass (front of the line access and a guaranteed burger). · Coca-Cola Two-for-$30 Tuesdays: Two tickets for $30 in the Club Level Pavilion every Tuesday, fans save up to 50%. · All You Can Eat Seats: For as low as $50 for group tickets on Super Value games and $60 at the gate, fans can enjoy unlimited smoked BBQ sandwiches, chicken wings, all beef franks, potato salad, peanuts, popcorn, chocolate chip cookies, Coca-Cola products, and draft beer. · B.J. 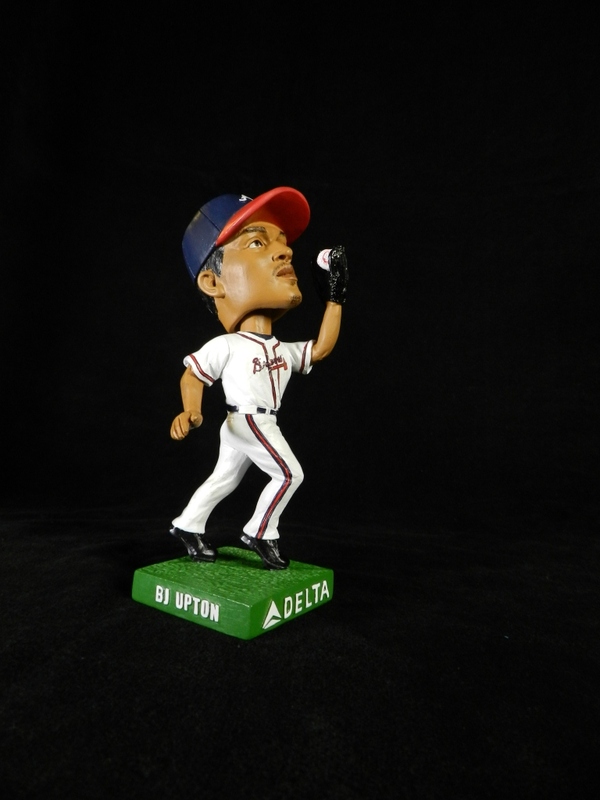 Upton Bobblehead Giveaway presented by Delta Air Lines: The first 20,000 fans will receive a B.J. Upton bobblehead. · Braves Batting Practice Experience: Enjoy a once-in-a-lifetime experience from the field and watch your favorite players up-close while both teams take batting practice before the game. Visit www.braves.com/battingpractice for more details. · At The Ballpark App: Fans visiting Turner Field this season can connect with their Atlanta Braves using the new and FREE At The Ballpark app, available for iPhone and Android users. Through the app, fans can upgrade their seats, access video highlights, listen to the Braves radio broadcast and much more. Visit http://www.braves.com/ballpark to download today! · 50/50 Raffle: The Atlanta Braves Foundation will be selling 50/50 raffle tickets electronically throughout Turner Field until the end of the sixth inning. Stationary kiosks can be found at aisles 132 and handhelds will be carried by the 50/50 team. 50% of the proceeds will benefit the Atlanta Braves Foundation. · College and AAA Discount: Two Upper Box tickets for the price of one with a valid college or AAA ID card. · Military Discount: Two Upper Box and Outfield tickets for the price of one ticket with a valid military ID. · $1 SkyLine Seats: Available two and a half hours before every home game at the Turner Field Ticket Office. Fans can purchase tickets by visiting braves.com/tickets, the Braves Ticket Office at Turner Field, the Braves Clubhouse Store at the CNN Center, all Ticketmaster outlets or by calling 1-800-745-3000. Atlanta Braves games are broadcast on FS South and SportSouth. Radio broadcasts can be heard in Atlanta on 680 the Fan, Rock 100 FM, 93.7 FM and regionally on the Atlanta Braves Radio Network. Follow the Braves at braves.com,facebook.com/braves, and twitter.com/braves.